The island of Rhodes is famous for its nightlife because it is a very cosmopolitan place and has every thing to offer in terms of entertainment. Sophisticated clubs, bars, casino and huge nightclubs are open all night long, ready to provide the visitor with every thing he needs to enjoy an intense and unforgettable night. Most of the nightlife of the island is located in the City of Rhodes and in the touristy resorts such as Faliraki or Lindos. During summer, various cultural events are proposed in the City of Rhodes and the many theatres of the capital have daily performances and concerts of classical and modern music. Also there are 2 cinemas, Metropol and Pallas, available in Rhodes City and play a wide range of films. The Casino of Rhodes is housed in the Grand Hotel Summer Palace, in the heart of the city and the entry is permitted to adults only with presentation of a passport or ID. Around the same area ‘Niochori’, you will find all kinds of restaurants and bars, pubs, and cafes, some of the bars and restaurants along the street are made especially for several nationalities from Scandinavia like Norway, Finland, Denmark et.c ,with their signs written in Norwegian, Finish and Danish. Closed to this area also, is the famous bar street Orfanidou, which is full of Scandinavia people during summer time with partys till morning. Also a great variety of modern and romantic bars, atmospheric piano-restaurants, lively nightclubs and places playing Greek music are available in Rhodes Old Town for those who want the real and unforgetable nightlife! Outside of Rhodes town about 15 min. is one of the most popular touristy resorts Faliraki. Faliraki Bar Street and Club Street is a paradise for young clubbers and pubbers! Every night the heart of Faliraki town beats fast and strong. Visitors can choose British and Irish pubs, sports bars, discos, karaoke.. that’s the first side of Faliraki.The second includes nice-quiet cafes and tavernas to choose from, with different cuisine, Greek traditional, Chinese, International or Italian food. Some Greek tavernas have also local folklore dancers who perform Greek dances. Another special place in Rhodes island is Lindos, 50 km. from Rhodes town. Very popular and romantic! Lindos has many bars and restaurants supplying the needs of visitors. Dinner can be enhanced by a beautiful view when eaten in one of the many rooftop restaurants. There are a number of bars and clubs that remain open until the early hours of the morning but the noise levels are controlled. There are bars and clubs in many of the island’s areas that stay open until the morning hours and have music for all tastes. The island of Rhodes is well known for its nightlife that offers multiple choices. Rhodes nightlife offers a lot of fun and excitement both varying and at considerable priced. People of different age groups and ethnicities from around the world come here to dance for whole nights and enjoy refreshing drinks in one of the many attractive bars such as at Rhodes City, Lindos, Trianta and Faliraki. It is therefore highly recommended places to visit for Rhodes nightlife. Fun never stops in Rhodes. It follows the island in all of it’s expressions. Rhodes celebrates summer, celebrates life! She has “temples” dedicated to her and they are full of legends, celebrities and thousands of sweet memories. In the afternoon, just before the sunset, you can hear the songs of sirens which speak about dancing and unlimited fun. Few can resist them. If you love Fiesta follow them. Whether you prefer something relaxing or whether you prefer something more intense you will find it in Rhodes. Rhodes is known as a cosmopolitan location for nightlife where you can avail every sort of music such as live, rock n’ roll, disco, Greek traditional and international music during your Rhodes holidays. In terms of entertainment, you will find some of the sophisticated nightclubs, bars and casino opened for whole night. You will therefore be entitled to things of your needs and unforgettable night during next Rhodes holidays. 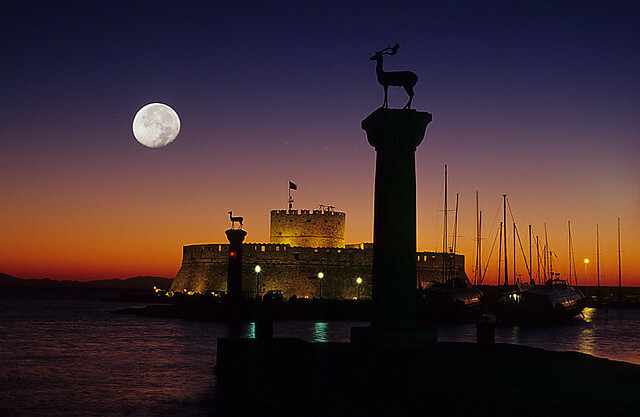 During the high season, Rhodes claims one of the most active nighttime scenes in Greece outside of Athens. Granted, some of that energy is grounded in the resort complexes north of the city, but there is enough to go around. The tourist guide greek-tourism informs you about the restaurants, lodgings, hotels and businesses that from which you’ll be satisfied and recommend Rhodes to all your friends enticing them to visit. We are choosing the best cafe clubs, music bars, nightclubs, beach bars and clubs bearing in mind these criteria as well as what the locals and the Internet visitors told us excluding our opinion for those hotels that we think the most of, and we recommend without doubt that you should visit them. In Rhodes you should absolutely visit. The most cosmopolitan areas in Rhodes (Rodos) are the Old Town that offers many bars to relax and enjoy a drink while watching the harbor and the Medieval scenery, Faliraki where the entertainment is usually wild and exciting with lit streets and numerous clubs for dancing but also Mantraki in the New Town that is full of lounge cafes. The Nightlife in Rhodes will get you of the ground. Your own common sense is as good a guide as any in this ever-changing scene. In a city as compact as Rhodes, it’s best to follow the lights and noise, and get a little lost. When you decide to call it quits, shout down a taxi (if you’re outside the Old Town) to bring you back — just remember where you’re staying. A consistent flow of sentiments, colors and music, all as a whole attract tourists from around the world for exploration during summer Rhodes holidays. Illumination of thousands of lights in the evenings and nights in the Rhodes Island therefore indicates that the party is just going to start. As a rule of thumb, the younger foreign set will find the New Town livelier than the Old Town. Cafe scenes are located on the harbor, behind Academy Square, or on Galias near New Market. The bar scene tends to line up along Diakonou. In the Old Town, most of the clubs and bars are found along Miltiadhou — these tend to be more frequented by the local youth. There must be at least 100 nightclubs on Rhodes, so you’re sure to find one to your liking. Being one of the popular nightlife events on the Greek island, Rhodes has a lot to offer to its tourists so that they can make best Rhodes holidays during their stay. Apart from enjoying its leisurely romantic walks beside the beach in evenings, you can also visit many of the parties at various bars and clubs. Rhodes gives the impression that this Island never sleeps. Moreover, you can enjoy sun-setting scenes here. Rhodes is one of the liveliest islands in Greece with a varied nightlife composed of bouzouki clubs, Greek folk dance nights and dance clubs. The streets off Faliraki beach are home to many popular cafés, bars and clubs. There is also a casino next to Elli Beach for those who want to roll the dice. Old Town has a number of good entertainment venues including the Alexis Taverna, which has hosted Winston Churchill and Jackie Kennedy. The Son et Lumiere (Sound and Light) show at Palace of the Grand Masters is excellent, and to see traditional Greek dancing visit the Nelly Dimoglou Dance Theatre.